For contract healthcare facilities that serve infants and youth, the end of 2012 marked the beginning of the US Consumer Product Safety Commissions’ (CPSC) new crib safety standards. All cribs in use in the United States are now required to be compliant with the new Standards 16 CFR 1219 and 16 CFR 1220. Cribs manufactured after July 28, 2011 were constructed to meet the new standards but any crib manufactured prior to that key date likely requires replacement. These wide-sweeping regulatory changes mean that child care and health care providers across the country should have replaced existing cribs by 12/31/2012 although it is believed that many facilities did not voluntarily comply – likely because of the high cost of replacing quantities of cribs. States’ Attorneys General have the authority to inspect and enforce the new standards. So what is different in the new standards? Most notably, the new standards eliminate ay drop side rail cribs. Drop side rails have been available on cribs for decades and had been considered an industry standard. Care providers whno have become used to the convenience of the drop side rail to facilitate reaching in for infants and toddlers can be assured that new models can include hinged access panels or adjustable height mattresses. Additional standards upgrades include heavy, more durable hardware; thicker, stronger slats; and heavier mattress supports. ...is to look at the date of manufacture which is typically affixed to the underside of the crib frame. 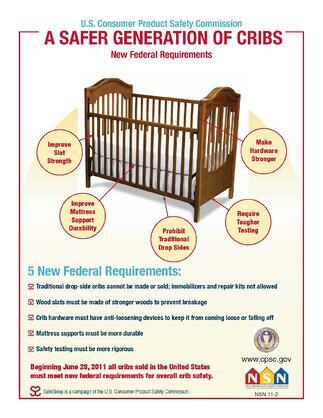 Cribs manufactured after 07/28/11 should be compliant since the CPSC heavily enforced compliance by US manufacturers and retailers. No drop side rail cribs are permissible so if you are working with drop side cribs you can be assured your cribs do not meet new standards. Also, decorative elements are no longer acceptable so any cribs with any adornments are not compliant. Other features like stronger slats and mattress supports are not easily distinguished so date of manufacture or a copy of your cribs’ compliance certificates might be the best way to determine whether or not your crib needs replacing. When considering replacing existing cribs in your facility, always work with a reputable contract furniture seller who can give you the right information on compliance standards. Compliant cribs include portable, folding, wood and metal options and costs are relatively reasonable.